Thanks everyone, I now understand the basics of stable & unstable axis of rotation. I went through this learning curve recently too, and it has been enlightening. I understand that a docking spacecraft, when docking in line with the axis of rotation, if it is big enough, MAY cause THAT axis of rotation to become unstable. When designing a rotating space station you just have to take into account how adding mass to the station changes (or doesn't change) the centers of rotation for the stations XYZ axis. If the station is massive enough, and/or the moment arms are long enough, docking things like cargo & crew pods shouldn't be an issue. I understand that a dumbell style rotating spacestation is very stable by itself. However, dock a spacecraft to the centre of rotation and it immediatly becomes unstable. No, there is nothing inherently unstable about a dumbbell shape versus a straight stick (aka baton) - the physics of them in airless space can be exactly the same. What makes them non-optimal for space station needs is that they are only stable in one axis of rotation (the X). But if you try to dock something to them at their center of rotation, you are now adding a 2nd axis (the Y), and the physics of that are too unstable to keep that mass docked to the side of the rotating X axis. Minimum design would be 3 habs on even length truss spokes joined in a Y shape (No centre hab). Cheapest Y style & very stable but what would be the point? The disadvantages 1a, 1b, 1c & 1d above all still apply. With long enough moment arms, and enough mass at the end of those arms, this would be a very stable configuration, and assuming you don't try to dock too much mass at the center of rotation, the physics of the rotating station would not change with the introduction of the small amount of mass at the docking port. So no, you would not have to stop the station to add or subtract mass (i.e. crew and cargo) from the station. Personally I think 4 arms make better sense, but three is the minimum to ensure stability. 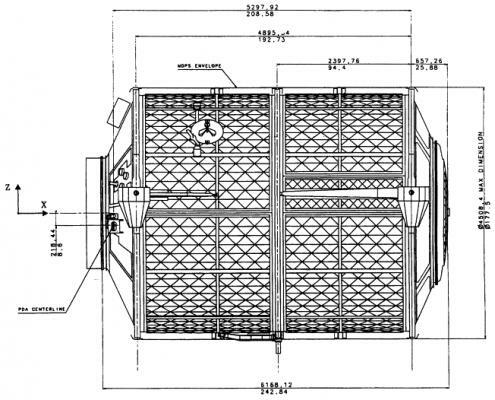 Perhaps something massive, like the batteries, could be stored roughly in the middle of the tubes but on runners that enable them to be moved up and down the tubes. So to keep the central docking port(s) on centre of rotation you just move the batteries up or down. If having batteries inside the tube is too dangerous then by all means mount them in a similar way to the outside of the truss/tube. No matter how you design a rotating space station, you are going to have to have a way to deal with off-center rotation at the docking hub. And the only ways to do that are to 1.) use moveable masses to realign the center of rotation for each docking maneuver (your suggestion), or 2.) have a docking port that can deal with the off-center rotation of the station. Doesn't docking automatically change the location of the center of gravity along the docking axis? Except if you dock in the center of the center, as some have already suggested. Let's say we have a rotating space station that looked like a giant wheel, and all of the living and working space was 100m from the center of the station. Pretty massive. 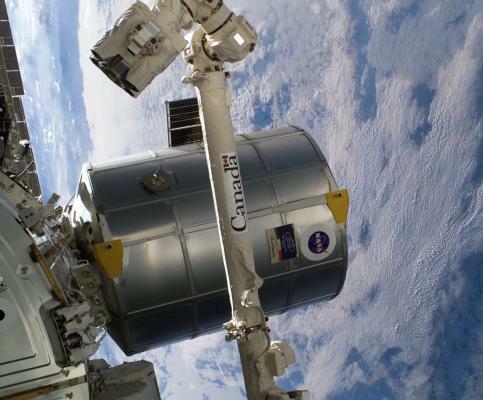 If we docked a cargo container the size of an ISS module to the dock that was at the center of rotation, the mass of that docked container would be too small to exert any changes to the rotation of the station. Do we agree? So then the question becomes how small of a rotating space station we can have that allows for that same sized ISS module-size mass to dock at the center of rotation and not exert any changes to the rotation of the station. Your dumbbell design is intriguing, and I think you just need to add 4 arms of them in order to create a stable rotating mass. Then it's just a matter of how you dock cargo and crew modules when the station is rotating off center - but I think that is a far more simple problem to solve that spinning and de-spinning the station. I don't understand why you've set "small" as a goal. Small doesn't necessarily have much effect on ease of construction or usefulness. Once you get past a certain size, it's not as if people will be climbing up and down to and from the hub. They'll be taking elevators, synchronized on both sides, up and down. At some point early on you're not going to pressurize whatever connects the hub to the ends, and it's easiest to just use cables. What I'm saying is that you very quickly reach a point where it just doesn't buy any advantage to make the station as small in diameter as possible. At that point you just stick long cables on the hub and go for slow rotation and a full 1G - the benefits outweigh the extra travel time. Note that 1000 km/hr isn't an unreasonable velocity for the elevators in a vacuum. Because the smaller and less massive a rotating space station, the quicker we'll be able to build one. If we wait until an individual, organization or government can afford a massive 1G rotating space station as their first attempt at artificial gravity, then you and I may not be alive to see it become operational. Small doesn't necessarily have much effect on ease of construction or usefulness. "Small" is most likely to affect how much mass is needed, and since the biggest barrier to doing things in space has been the cost of transportation to space, how much mass is needed is an important factor. Once you get past a certain size, it's not as if people will be climbing up and down to and from the hub. They'll be taking elevators, synchronized on both sides, up and down. At some point early on you're not going to pressurize whatever connects the hub to the ends, and it's easiest to just use cables. We really don't know what a version 1.0 rotating space station will be like, since there are multiple likely designs, but no one is funding them yet. 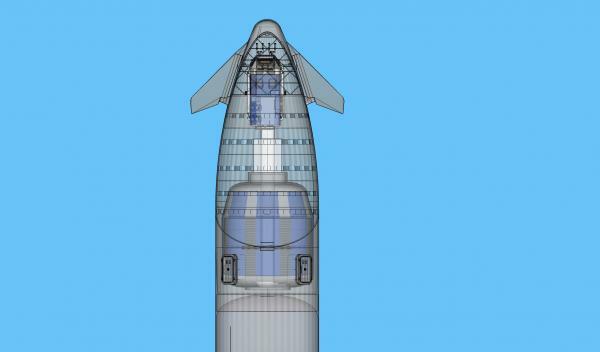 But a Minimum Viable Rotating Space Station might not have a lot of bells and whistles - meaning its occupants might have to climb up and down and not use elevators. What I'm saying is that you very quickly reach a point where it just doesn't buy any advantage to make the station as small in diameter as possible. You mean besides money? Because the money issue is what I'm most concerned about. At that point you just stick long cables on the hub and go for slow rotation and a full 1G - the benefits outweigh the extra travel time. Note that 1000 km/hr isn't an unreasonable velocity for the elevators in a vacuum. This thread topic is about what a "Realistic, near-term, rotating Space Station" would be like. It doesn't have to be 1G, and it doesn't need to have high-speed elevators. It just needs to be realistic, and near-term. And both of those, to me, are dependent on money, which is why I always try to focus on what is the least complicated method of doing something. 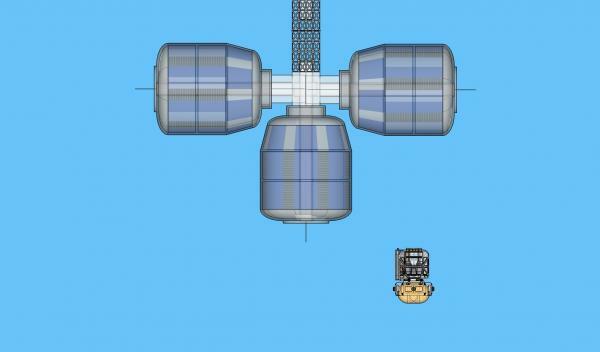 Easiest way to make the dumbbell space station stable with a docked ship is to make it Y or cross-shaped instead. Not a huge increase in difficulty. I think the bigger difficulty is probably building up confidence that the design is structurally sound when rotating, and designing rotating joints. In small stations we might end up seeing more spin up & despin designs, or designs that spin slowly and only provide centigee gravity. Does it need to have any rotating joints? It would be easier if any approaching ship just matched the spin of the station before docking as per the film 2001. As for confidence that the design is structuraly sound, I think this is a valid point, but only from the perspective of the novelty of the application. The basic physics and engineering should not present any serious difficulties. Possibly, but that puts strong constraints on the ship. Docking point near axis of rotation, ship must be rotationally stable, etc etc. I don't think the Starship could do that for example. I dont feel like my "dumb question" was adequately answered. People talk about docking on the axis of rotation, but that's exactly what causes intermediate axis instability. Instead, what about berthing in the plane of the rotation? Obvously, you wouldnt want to dock near the habitat, where the tangental velocity is huge... but you can still dock near the hub if you can get there before the next arm swings around. What's your radius? At 100 meters radius and 1 g at habitat, you're looking at a period of 20 seconds, or 10 seconds between two arms. And you'd have the spacecraft hanging from its docking port if it's rotating with the station, so it would have to spin up and thrust towards the center while docking. You could probably do that with a specialized craft, but if you want it to be near term, easiest way to do it is to just spin down the station. My bad (at least for my attempt). Though until we get an operational rotation space station I don't think there are dumb questions. People talk about docking on the axis of rotation, but that's exactly what causes intermediate axis instability. Only if you have a one dimensional design such as a rod/stick that is tumbling. If you have an "X" shape with long enough arms (which you need for any reasonable artificial gravity) then the station would be stable when docking at the center of rotation. Instead, what about berthing in the plane of the rotation? If you mean a ship would latch onto a point on the station furthest from the center of rotation, I'd say that would be very tricky. I think docking at the center would be far less complex, and far more safe in case something goes amiss. Using SpinCalc we can see that if you want Mars level gravity (i.e. 0.37G), and you only want the station spinning at 3 RPM, then the diameter of the station needs to be about 73m (~240 ft). This is a very big diameter, with a very large moment arm. If you docked a module the size of an ISS module at the center of rotation the station will still have a stable rotation - it's only if you have something docked that sticks out a long way (maybe 20m) that instability becomes a possibility. Not nessesarally at a point furthest from the axis of rotation, merely in line with the axis of rotation. With the station above spinning flat on the screen, (quarter rottion would have arms vertical) docking at the carrot has a much smaller rotational arm, but doesnt destabilize the rotation at all. If the station was rotating perpendicular to the screen (quarter rotation has arms hidden behind one another) then it would be unstable. While I applaud your use of graphics, unfortunately the problem to be solved exists in the 3D world, and your 2D drawing can't describe the problems and solutions adequately. For instance, if the station you drew was rotating clockwise or counter-clockwise, and the ^ was a cargo pod trying to dock, then the station would ram into the cargo pod as it rotated. If our viewpoint was on the plane of rotation, where the ends of the station were coming towards us and receding from us, then the cargo pod could dock at the center of rotation. However, the mass that docks would want to twist into the plane of rotation, making the docking procedure unstable - especially when it comes time to undock. Make the station a large "X" and you won't get the twisting motion, because that plane has far more mass than the cargo pod can impart. One thing you could do is dock at the center, perpendicular to the rotation plane then swing the dumbbell and shuttle assembly 90 degrees around the x axis so the shuttle goes into the main rotation plane. So a controlled roll. I think it would have to be a reaction powered roll, with a counter thrust at the correct position. Would this then be stable? Seems it would take much less energy than stopping the whole dumbbell. My interpretation was using Canadarms to move the spacecraft into the plane of rotation before docking, but using RCS to change to a stable configuration after docking does put an interesting... twist on it. One thing you could do is dock at the center, perpendicular to the rotation plane then swing the dumbbell and shuttle assembly 90 degrees around the x axis so the shuttle goes into the main rotation plane. So a controlled roll. I think it would have to be a reaction powered roll, with a counter thrust at the correct position. Would this then be stable? After the shuttle is in the plane of rotation the entire structure would be stable - though a little off center in rotation (which shouldn't be a problem). Seems it would take much less energy than stopping the whole dumbbell. But it would take significant energy (more than just maneuvering thrusts), and it would be a complex maneuver for both docking and undocking. Not only that it would require more mass be added to both the station and the "shuttle" to handle the forces involved. I suppose it comes down to the tradeoff between how much fuel would be required to make the whole system stable after docking and how much fuel to spin down, dock & then spin up again. Undocking could be interesting though. I agree with Coastal Ron that 3 or 4 arms is probably the way to go. They need not all be habs. They could be anything really. A view of a habitat module inside the Starship, with a MMSEV vehicle as well. The fairing is really large! The habitat has a volume of about 300 m3 on three 40m2 floors. The MMSEV is a few tonnes (5 or 6? ), the bare habitat about 20-30 tonnes so there is plenty of mass capacity left over for the connecting arms, docking ports, interior fittings and a bit of extra propellant for transfer to a propellant depot. -Single and dual non rotating habitats. -Triple, quadruple and more habitats as per the client's requirements. -Extra power with extended solar panels. -Extra thick walls for radiation protection in Moon and Mars orbit. -Thruster hub for Interplanetary travel. The Raffaelo module for the Space Shuttle is a possible precursor design. The module might indeed be built anywhere on Earth. I notice a lot of the discussion seems to be focused on symettric barbell formats. What about something like a space reactor on one end, with a strip of rad shielding between it and an arc of habs on the other end? I'm thinking something like the Peace Sign, with something heavy on the solo bar and the triple bar cross conneted. You could even have your thrust directly from that off center reactor so long as your acceleration is significantly less than your artificial gravity and along the axis of your spin. It looks deliciously counterintuitive, especially from the rotating frame of someone on the space craft. If thrust was NEP I wouldn't bother, but it could be useful if it was NTR or a fission fragment rocket etc. Could simply be a three module station. That would probably be the minimum stable configuration in an X-Y plane. I don't expect a significant nuclear reactor to be allowed in low Earth orbit, and anyway what would need so much power? A spaceship is really another subject, but I'm certain that the design could lend itself to adaptation towards a interplanetary vehicle.